The first thing to do when connecting a new computer monitor is to calibrate it properly to ensure that it displays the best possibly image. Most computer monitors come with a CD that can be used to calibrate the monitor. Most of the time those programs are not the best possible way to calibrate the monitor though. We already covered a few applications in the past like Calibrate Your Flat Screen Computer Monitor or Monitor Calibration Wizard. The specialty of the Online Monitor Test is that it comes as a online service but also as an application. Both versions are divided into different test areas: Color Range, Trailing, Homogenuity, 1x1 pixelmapping and Text. Each section is accompanied by a info panel that is explaining the test at hand so that the user understands what the test is about. The info panel can be turned off once the user knows what the test is about to have full access to the screen without obstruction. Both versions can be run in full screen mode for maximum effectiveness. 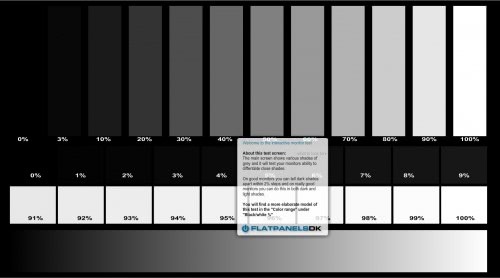 The Color Range test is basically testing the color reproduction of the computer monitor by displaying color gradients and percentage screens. The trailing test is testing movable objects on the computer screen. The speed can be altered as well as the color and position of the box that is moving on the screen. The third option is to test the computer screen for homogenuity. It fills the screen with one solid color. This can also be used to test the monitor for dead pixels. The 1x1 pixelmapping test is mostly useful for televisions and not computer monitors. The test displays a 1 by 1 checkboard of white and black pixels. The last and final test is about text display on the computer monitor. The website contains a second service which can be used to test input lag on two computer monitors. There is not much information about the software application that can also test the computer monitor. It worked fine on a Windows XP Service Pack 3 test system. This is a monitor _tester_, not calibrator. This is good for comparing different models o monitors, but it does not test anything that can be calibrated against a standard.